with Tara Greene Astrologer and Maureen Walton Artist. 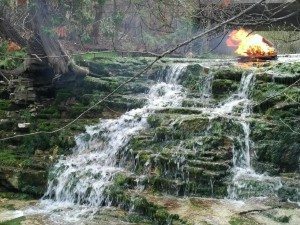 We created in depth ceremonies with the abundant waterfalls! and shifted to gathering rituals the following day, all at the foot of the waterfall. This was combined with engaging in the Inca meditations in the Cosmic Lodge, and choosing an arcana card to move into dream time with. There was a lot of opportunity to discuss our astrology charts. Our intentions were to release some womb wounding for ourselves and on behalf of others. After lunch we met again at the foot of the waterfall facing upstream. We shifted our intentions to gather from this pure refreshing source, empowering ourselves and all. listened for messages from Gaia and Cosmic Mother..Meditating with eyes open. The inner and outer darkness became one. 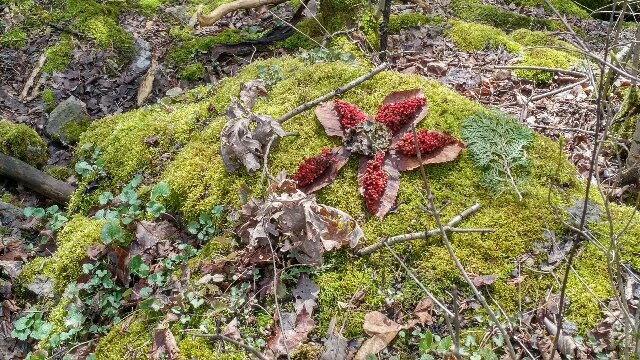 Spending some solo time in the woods, we created earth altars of gratitude. Later we inscribed our personal manifesting symbols on sheets of soft pure copper. and received from them in return. 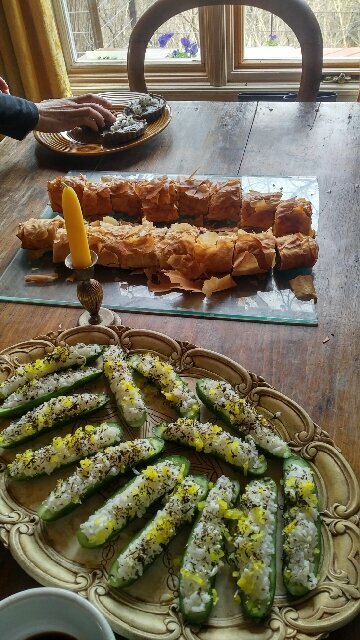 and nutritious support for our intense work. committed to this work for the good of all. 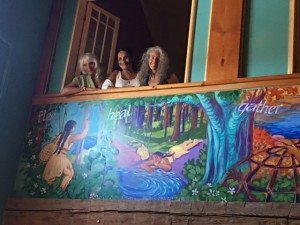 Gratitude to Tara Greene for her in-depth interpretations of the skies and for introducing us to the powers of the myriad of Goddesses, who influence us each day. 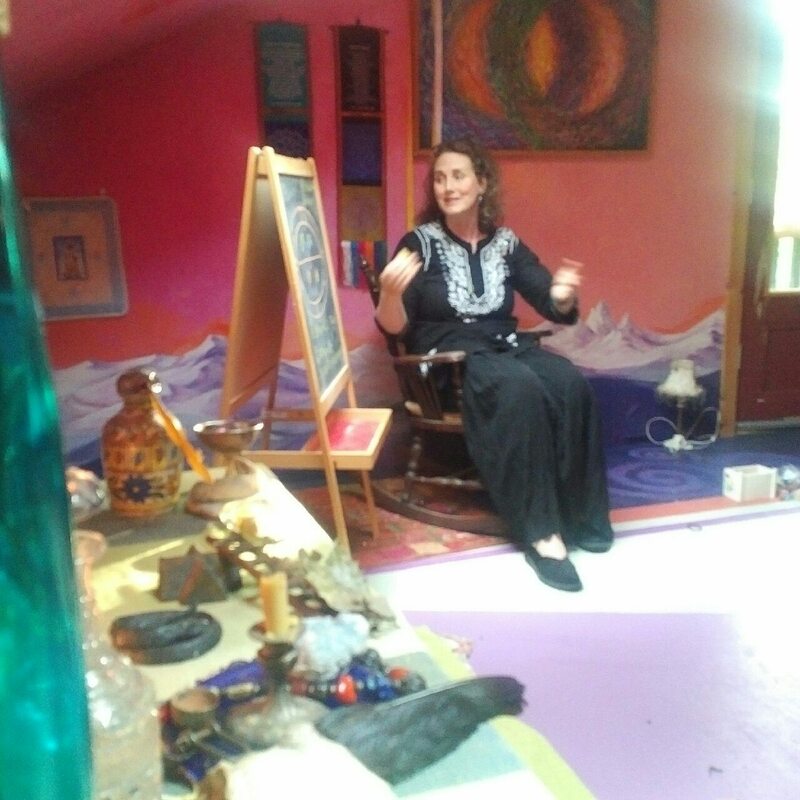 Karen offered a series of three 24 hour retreats this spring. small groups of between 6 and 8 attended. Because of a privacy request we have not shown all participants engaged in ceremony here. An in-depth rediscovery of the inner, spiritual technologies of the body through deep union with the land, an indigenous world-view, and a new understanding of the concept of sacrament. These lost technologies include the act of conscious birthing in both substance and consciousness. The Hibernian Cauldron of Life is discussed and experienced. A comparison between an Irish Priestess and an Iroquois Medicine Woman.The Hibernian tradition of educating the young child and youth in nature’s mysteries. 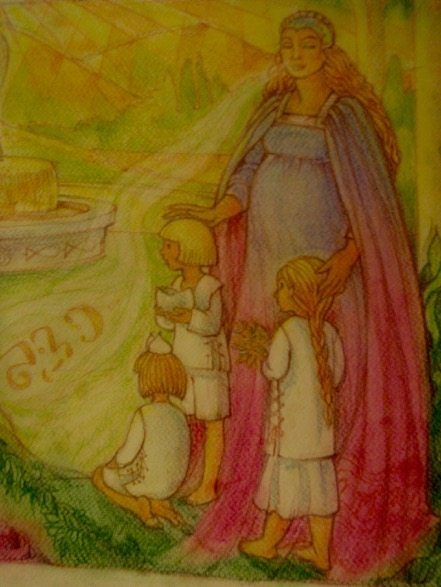 Ita the Druid Priestess of Ireland with her prodigies. Jagosawseh and her prodigy Dagonawida in Ontario. Thank you so much for your attendance at last weekend’s retreat. I have been processing much since our gathering; and have been working with many images in dreams. I encourage you to keep track of these, or, at least, make note of their visitations, inviting them into your limbs. (Retaining the content of these visions will I predict, be quite difficult). The emanations of TAO will arise in the unconscious as this is where the images that contain the earth-forces are currently ‘stored’. 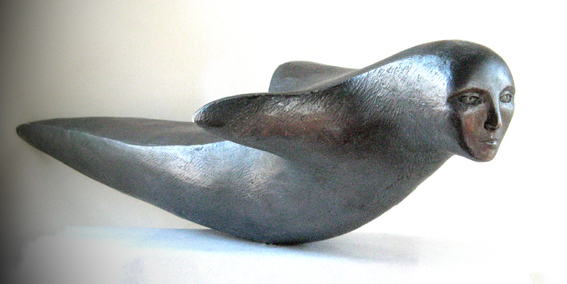 The stories of Sedna and the Arctic (which Maureen knows very well) form the soul-centre of the work. Thanks to all for your soul-ful participation. Much knowledge/wisdom was surfaced through community and collaboration. 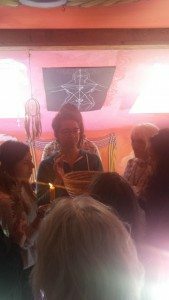 Reclaiming our Holy Womb Power. Dr. Marguerite Rigoglioso from California. 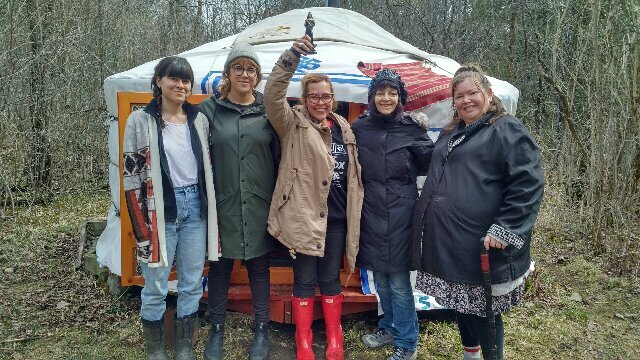 We welcomed and honoured the Huron Peacemakers of Tyendinaga, the Virgin Birth Mother Kahetosuk, her son Dagonawida, his foster mother Jagosawseh and his orator Heyawatha. The reason we honoured them is because Wyldwood is situated on the land were they lived 1000 years ago. 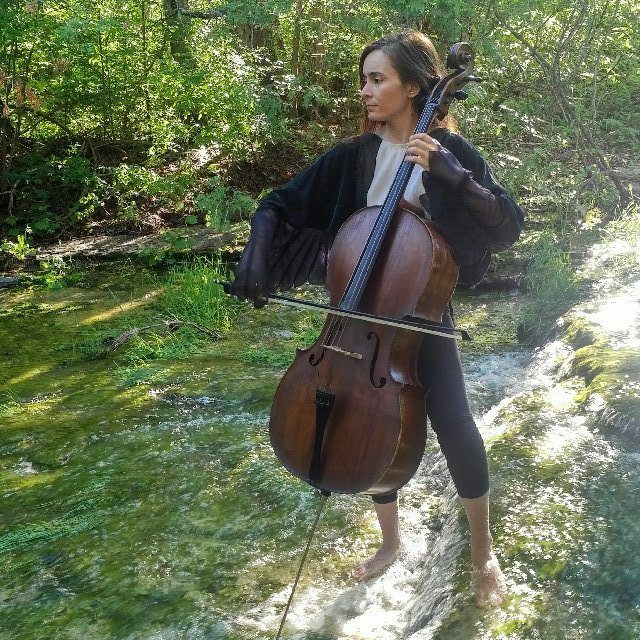 Amber Walton Amar shared improvised cello accompaniment for our opening and the meditation that followed. 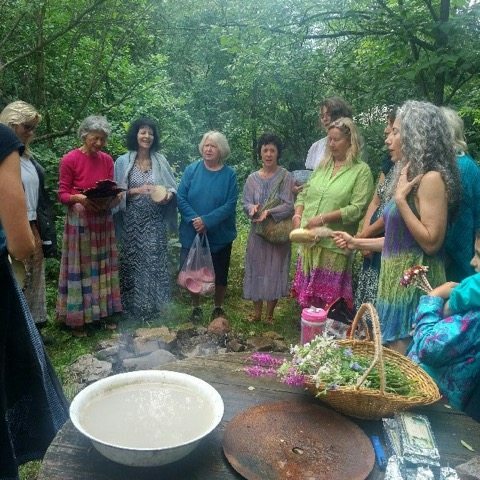 Marguerite shared her research of the seven mothers of creation and revealed much new information, some of which connected those mothers as partners of the 7 male Rishis that Swami Kaleshwar named as the source of the Holy Womb Chakra wisdom. Possibly another puzzle piece found, connecting the 2 stories. 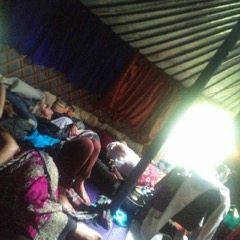 We descended to the cosmic yurt and connected to our wombs to release any negative energy still held there by various lovers. We did this by meditation and envisioning and writing a list on paper. Blair built a bon fire to last into the evening. 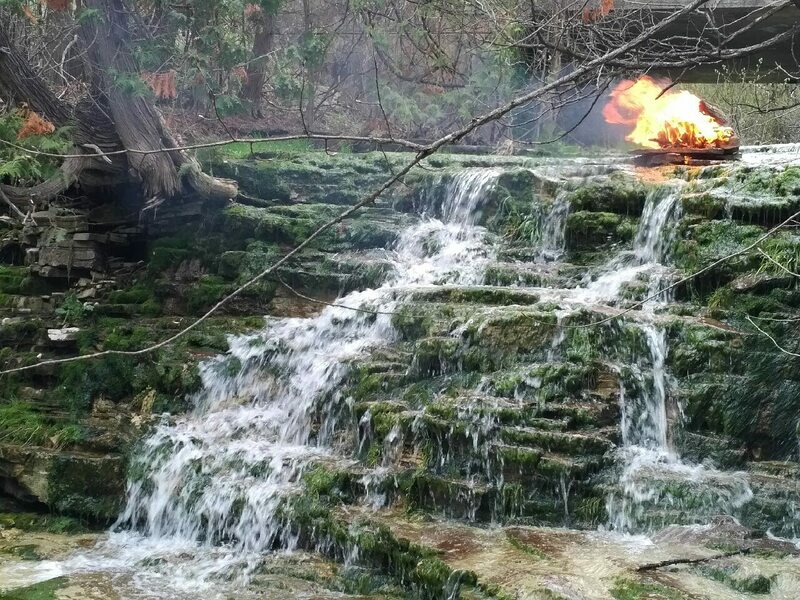 We burned our lists in the fire while others drummed. 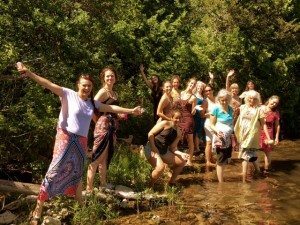 Journeying to the river, we released further by submerging and facing down stream, then finally, ready to gather in divine energies, we faced up steam. 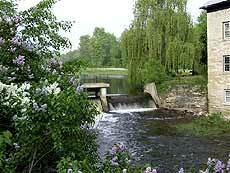 The strong current supported our abilities to gather pure energies. 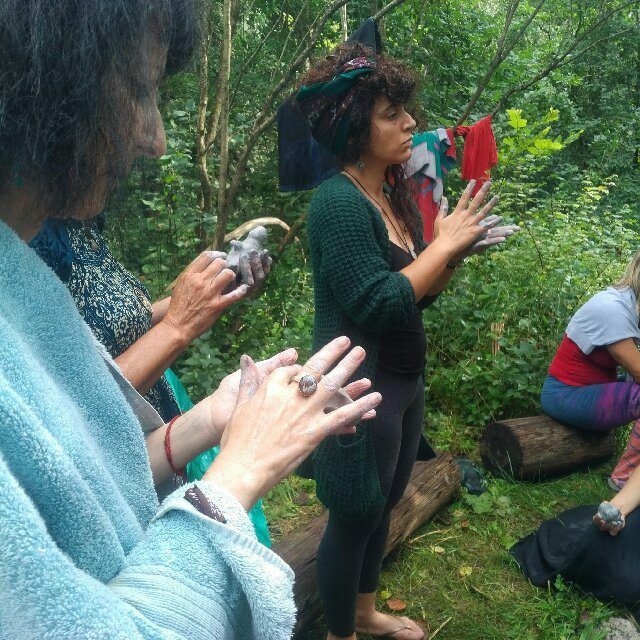 We ascended the hill to the meadow between the yurts to create a womb image in clay. Beautiful pieces were developed and as the rain came quickly most were dissolved during dinner -back into a little pool of mud!Next time I will bring them inside. However this too was as it should be. They transitioned back to nature! Maureen led the dark lodge evening expressing the need to return to spending time awake in the dark, as it was before electricity. The darkness is were we restore all the clairs to fullness. The dark of the womb! Light comes and goes but darkness stays. We sat in the dark in silence with eyes open!… feeling the strong intensity, passing oils and sweet peppery jelly to taste and smell. 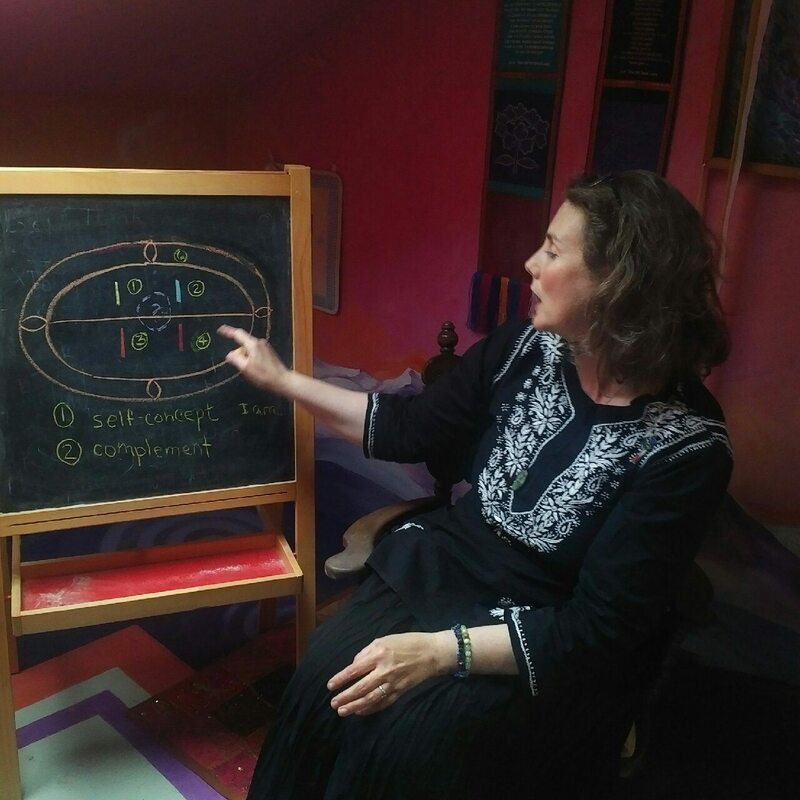 Maureen offered the Inca meditation in the dark called the luminus structure. In the morning Karen and Maureen demonstrated the use of the meteorites to increase the gathering or releasing effects of the Luminous Structure.We returned to the ceremony room and Maureen offered her PP on various clues bringing us closer to the reality of the Blood Mastery technologies once practiced. 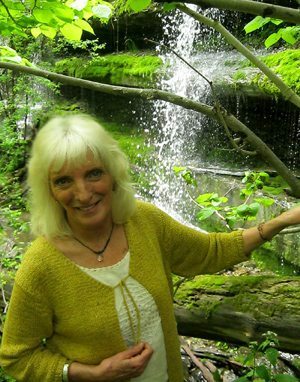 In the afternoon Marguerite introduced us to Swami Kaleshwar’s news of the discovery of an 8th major chakra. 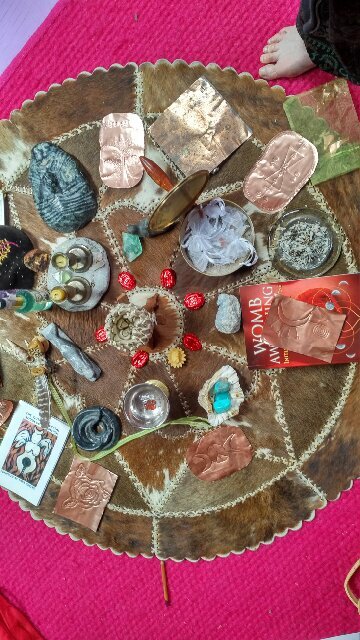 A portal for Soul energy & more, to enrich and bring balance to the womb. This will allow women to bring forth more powerful and pure creations into the world. 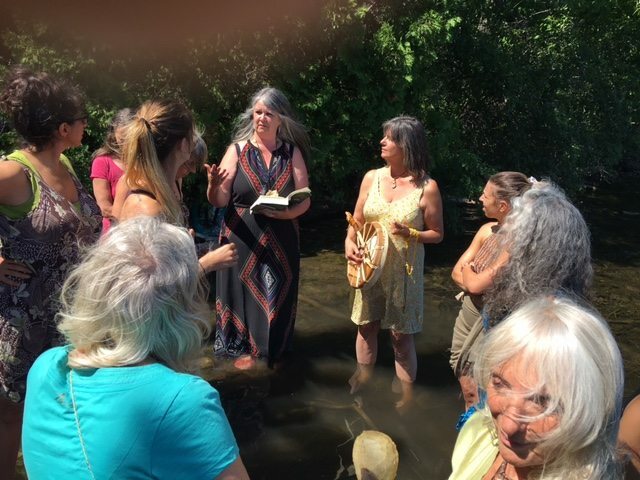 Thunderstorms, sun, wind and rain surrounded us and aided us in our cleansing and awakening our connection to the sacred water element in our wombs. Undines were everywhere! Learning our history and earths history through the feminine lens. Recovery of lost feminine practices ….blood masteries etc. The need to engage in handwork and art forms with natural materials to better ensoul our world. 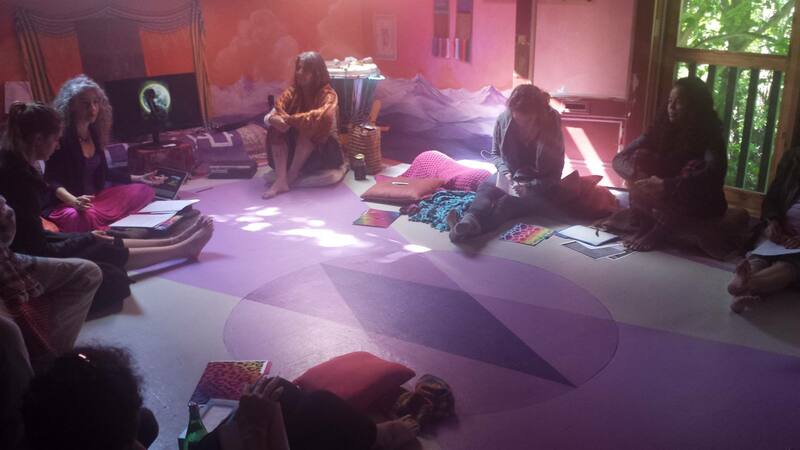 Normalizing womens’ practices of sitting in sacred circle, regularly as essential. Changing the language around the dark. Remembering it as the divine inner feminine source of life. The place of creation. TheVoid. Marguerite and I thank you for joining us. We loved the passion and knowledge and wisdom you shared with us. 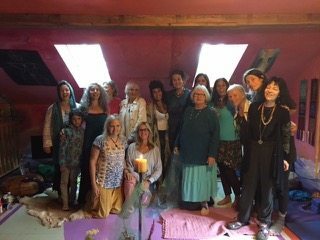 We look forward to continuing in this important journey with you,at Wyldwood to reclaim our feminine spiritual gifts of the Womb. 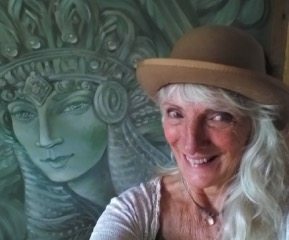 Maureen with her house mural Goddess! 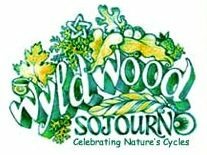 Here is a brief overview of our wonderful gathering here at Wyldwood Sojourn. 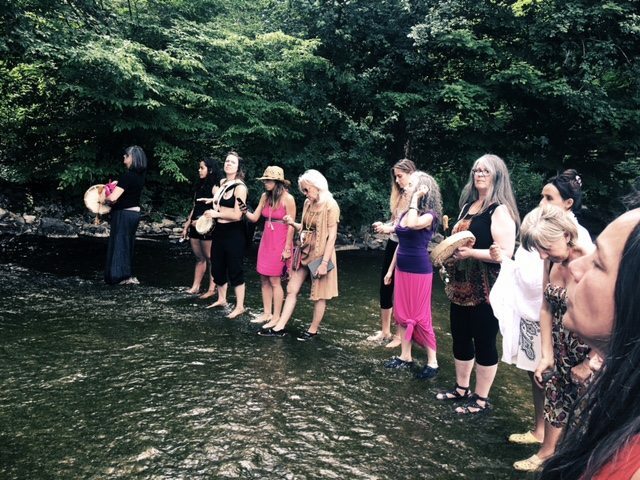 In gratitude to the 16 women who travelled from many places to join us. The eager enthusiasm to absorb the mysteries and magic we conjured up and carried through the weekend and beyond, was felt by all! 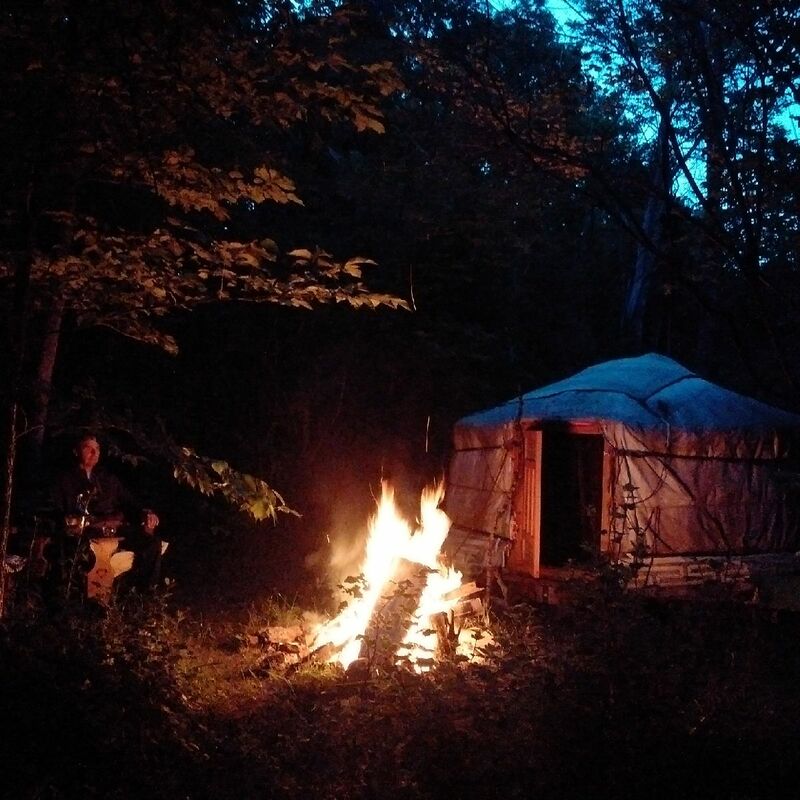 We immersed in the elements and engaged with them through sculpture, dance, song and drumming, ensouling ourselves in the process. We remembered our foremothers with greatly developed womb power, Kaheliokaha, her daughter Kahetosuk and Jagosahseh, the Mother of Nations. 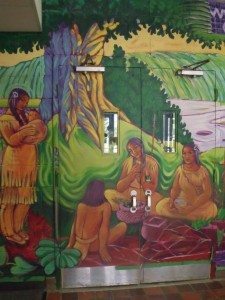 Three of the Huron Peacemakers who together with Hiawatha and Dagonawida developed the Great Law of Peace, that is one of the greatest the world has known, right here in Tyendinaga. 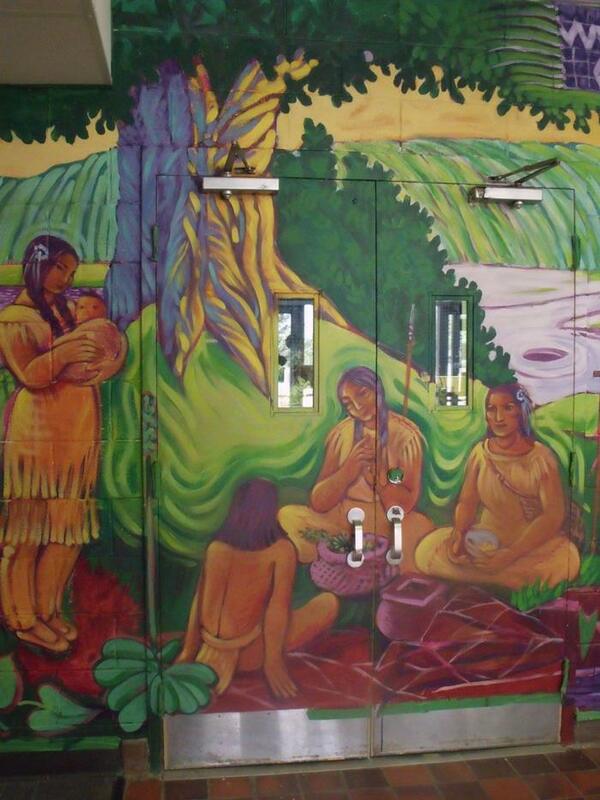 We deepened into the Woman’s blood masteries through the womb teachings of the Inca as led by Maureen. 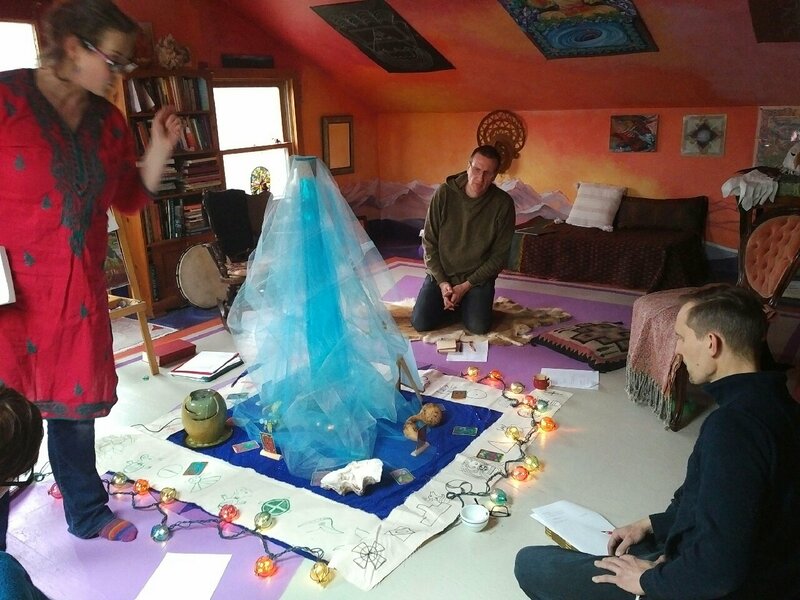 She offered us an ancient meditation called the Luminous Structure that carries the potential to connect us once more to our profoundly creative soulful wombs. This strengthens our ability to pull in only pure source, divine mother energy . We propose this method as one used by the Peacemaker mothers to self concieve. 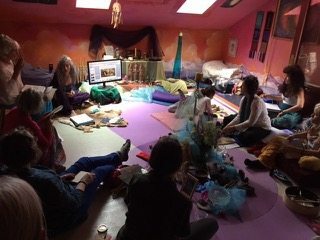 Weaving it all together with Marguerite we learned about the connection between the womb, the esoteric tantric practice of Divine Birth & woman’s oracular abilities as seen in the famous Oracle of Dodona in ancient Greece,were the priestesses channeled – yes – the Pleiades! As a touching surprise we heard in circle, the remarkable story of one of our sisters whose womb journey we will follow with loving care. At the mysterious lake, high above sea level, Dianne shared with us the Thanksgiving Address, well known to the Mohawks. 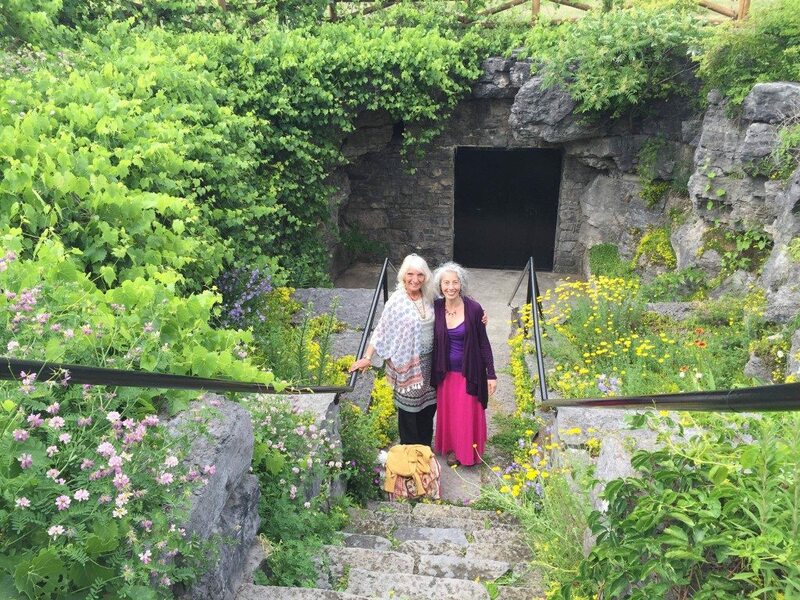 Through ritual in the sacred Tyendinaga Caves, we expanded the energetics of our own wombs. Sitting in the profound Darkness we felt the great presence of the Womb Nature of both our Cosmic Mother and her daughter the Earth Mother. We re-membered the power of the Comic Womb, the Wirrachoucha…Creator of all that is. 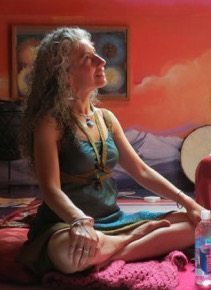 In the darkness of the cave and after our quiet meditations, we were moved to celebrate and spontaneously sang sounds, drummed and danced. One candle was lit and the shadows that sprang up seemed those of our ancestors, delighted to be remembered. Thank you everyone for your deeply moving and soulful presence. May you carry home the delicious new feelings and stirrings that fill your wombs, and spread that empowering creative vibration with all whom you meet! We hope you will continue to journey with us as the great undercurrent of this work carries us all along,worldwide. Lets keep in touch and share our new understandings in future gatherings. Your beautiful woodsy earth altars still lay hidden but vibrant, in tiny corners of the Wyldwood gardens! We are already planning the direction of next years retreat with Marguerite at Wyldwood and we are dreaming to create a gathering with Emmanuelle in Mexico. There will be a winter retreat with Maureen to celebrate the Darkness as Divine and as the ‘time of gestation’ during the earth’s in breathe. 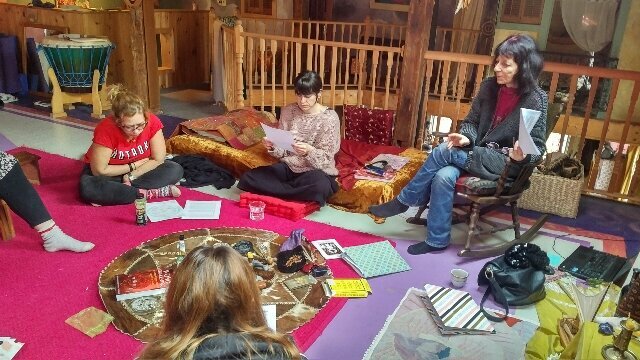 There will be lots of storytelling in the tiny moon lodge and more to be dreamt of, to happen in the cosmic lodge. 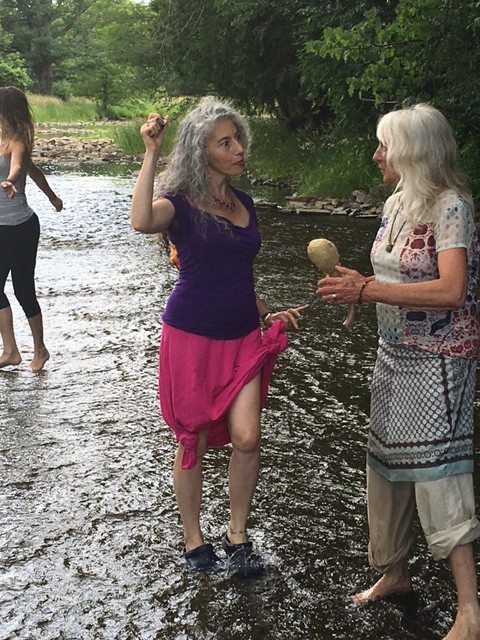 Roula Said will continue to offer Womb Dance and Ela Beilski, Kundalini classes. 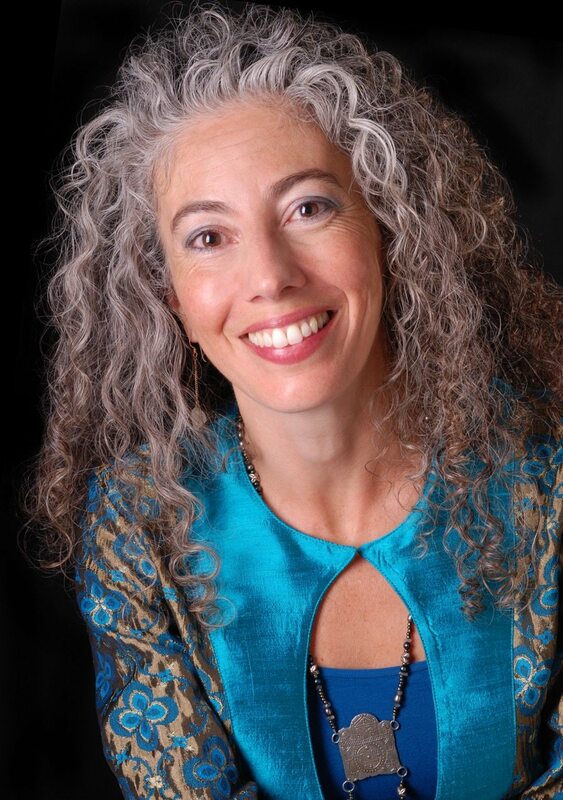 We also plan to invite Den Poitras, author of a book about woman’s ability to self conceive. 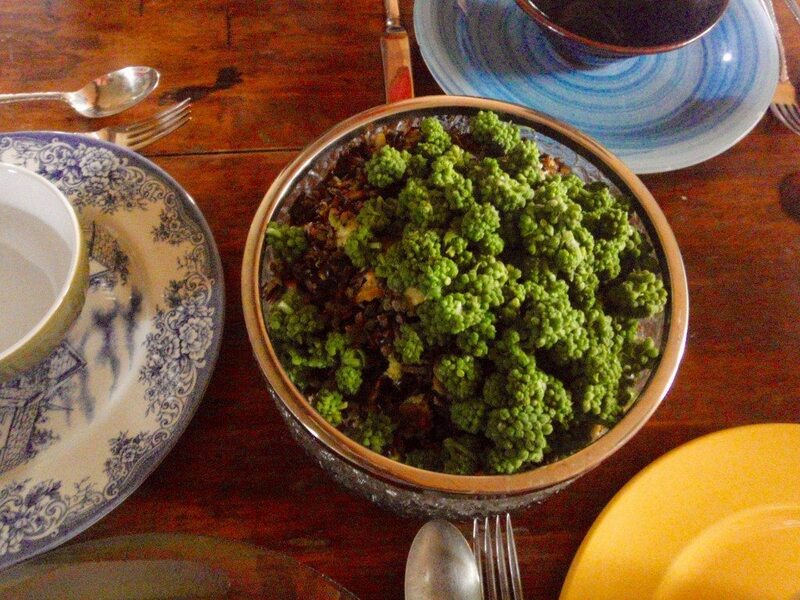 We will give lots of detail on these retreats soon. Please watch the schedule on this web site. 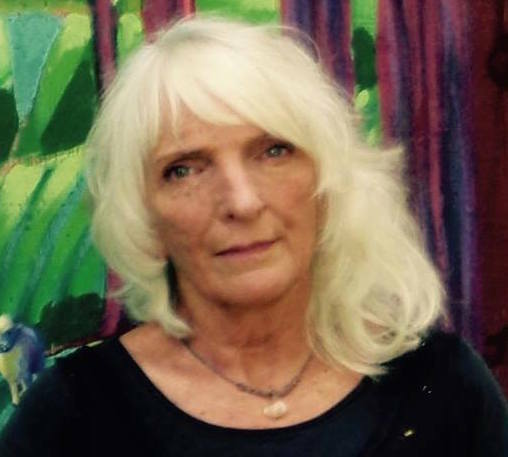 Marguerite Rigoglioso Ph.D is the founding director of Seven Sisters Mystery School. 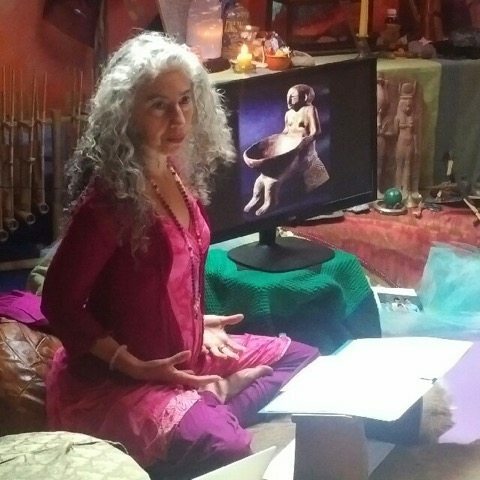 She is a scholar/practitioner of the ancient mediteranian mystery school traditions, author teacher channeler and clairvoyant guide who mentors men and women to help them cultivate their spirtual knowledge and bring their sacred knowledge to fruition. Marguerite’s pioneering books, The Cult of Divine Birth in Ancient Greece and Virgin Mother Goddesses of Antiquity, explore woman’s shamanic abilities in a revolutionary new light. 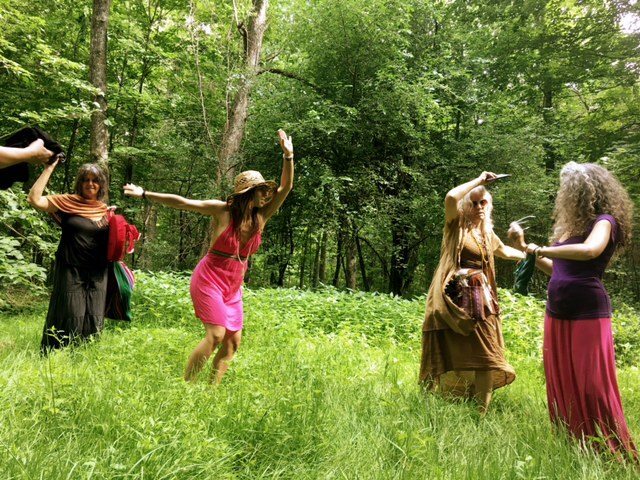 She is excited to be enrolling her new six- month programme Priestess of the Dove Training, reclaiming your self as an Sacred Oracle, designed for women who want to cultivate themselves as channelers of Divine Feminine Wisdom. Maureen designed this passive solar home in 1980. 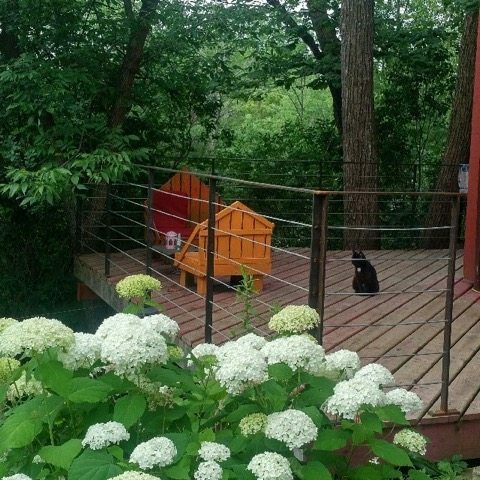 She bought the two wooded acres in Lonsdale in 1977 after traveling and working for 7 years in Europe, Australia, Papua New Guinea, Indonesia & Nunavut. 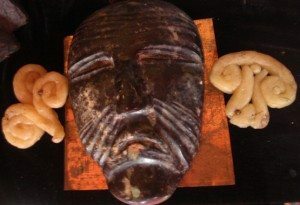 These travels sparked her awareness of the Shamanic world and fed her visual art making process. Maureen’s professional work has always been in the arts, as a painter animator, illustrator and designer. 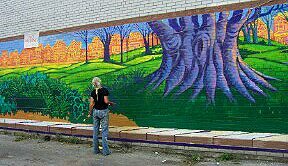 Her current profession is as a muralist for schools and businesses. 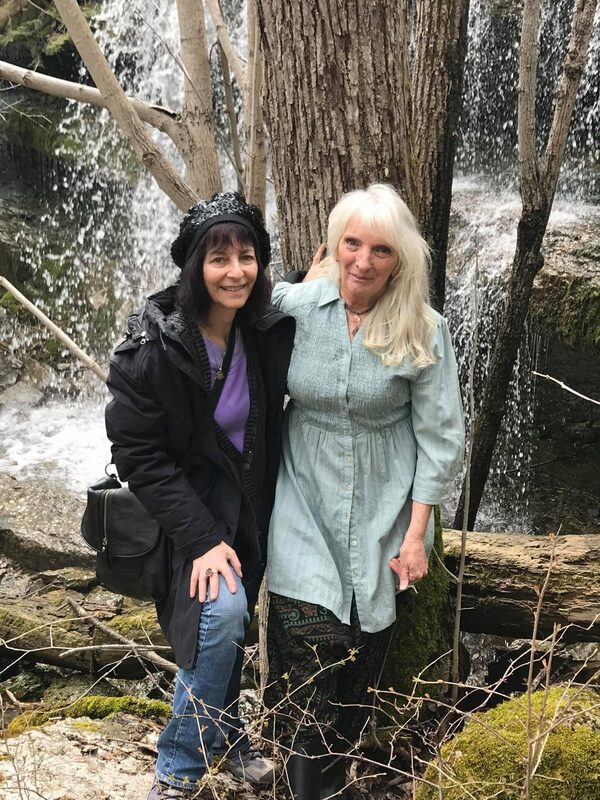 Maureen has always been a feminist and her dream to dedicate herself to uncovering lost Spiritual Feminine traditions, came true when she met and became a student of Cindy Lindsay in 2009, who lived and studied with the Qero, Inca shaman for 10 years. 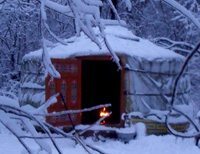 Soon after she began to host a Red Tent, inspired by Alisa Starkweather. 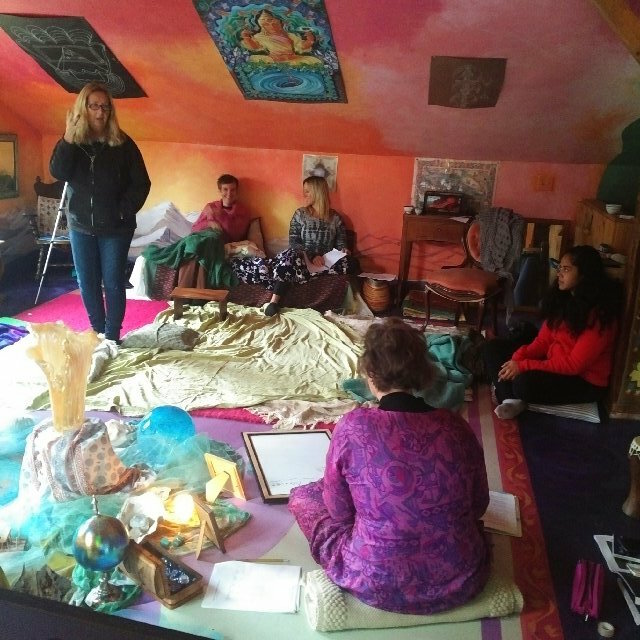 This grew into weekend retreats, were she began to teach the Inca Shamanic womb tradition and invite other teachers, who were uncovering suppressed feminine spiritual paths, such as Marguerite Rigoglioso. 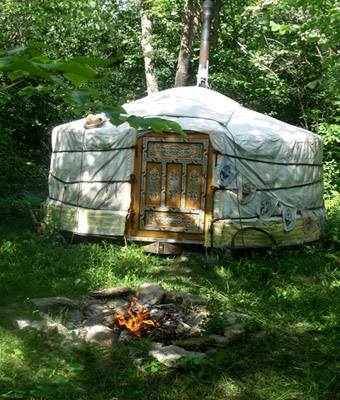 Maureen’s wooded hideaway began to grow into a ‘School of Womb Wisdom’. 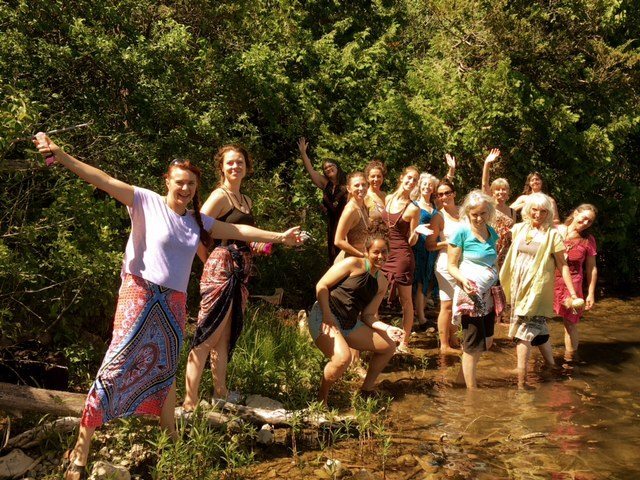 It is a safe sanctuary for women to meditate, honour their gifts as creators and reclaim the amazing sacred nature of their wombs (or energetic of). She looks forward to opening these teachings to men at the appropriate time. Her mother Eileen O’Brien chose the name Wyldwood Sojourn. Her father Ken Walton introduced her, as a child to the sacredness of the four elements. As women entering the new era many are passionate to learn indigenous teachings from around the world that hold the lost and hidden wisdom of Womans’ Womb traditions. In this weekend we introduced treasures from the Haudenosaunee the Inca and the Greek. Women’s source of Creation power comes from the alchemical processes in her sacred blood of life within her womb. The womb is the most Sacred place in a woman’s body. It is the only portal for blessings to reach the planet. Through understanding these mysteries we can begin to develop and increase our own womb power for creating beauty into the world daily.